Lance Booth - lbooth@shawmedia.com Sarah Nearhoff, of Crystal Lake, eats snow as her husband and son sled at Veteran's Acres Park on Friday, February 24, 2012. Four to 6 inches of snow fell throughout McHenry county throughout the night, though temperatures are expected to rise this weekend according to the National Weather Service. Lance Booth - lbooth@shawmedia.com Bill Nearhoff, left, and his son Ben, 11, both of Crystal Lake, pick up their sleds after sledding down a hill at Veteran's Acres Park on Friday, February 24, 2012. Four to 6 inches of snow fell throughout McHenry county throughout the night, though temperatures are expected to rise this weekend according to the National Weather Service. 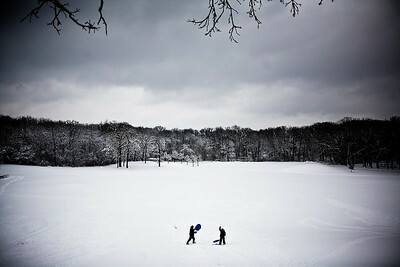 Bill Nearhoff, left, and his son Ben, 11, both of Crystal Lake, pick up their sleds after sledding down a hill at Veteran's Acres Park on Friday, February 24, 2012. Four to 6 inches of snow fell throughout McHenry county throughout the night, though temperatures are expected to rise this weekend according to the National Weather Service.